He came down from the Bronx in a block of ice. Nobody saw him for a while because there was a cold snap on and it wasn’t over yet. The weeks from the holiday season through mid-January 1973 had been raw and unforgiving. But on Wednesday, January 17th, the weather began to improve. Darleen Rubin, a freelance photographer (The Villager, W, and Women’s Wear Daily), was scheduled to do headshots for an actress. She began the shoot out on the balcony of her Christopher Street apartment, but as the sun brightened, decided to go down to a favorite spot by the river where the light was soft and flattering. It was shaping up to be a beautiful day. Rubin has an eye for beautiful things. She has photographed the clothes of Carolina Herrera, Calvin Klein and Michael Vollbrecht, and taken pictures of Jacqueline Kennedy Onassis visiting the Met. A long-time New Yorker, she never went off to distant lands to cover disaster and war. But that day a war of sorts found its way to her on the watery edge of the West Village. She and her client stepped out, happily planning the next set of pictures. But as they neared the river, they saw a knot of people gathered on the Morton Street Pier, staring down. They walked over and saw what appeared to be a thatch of hair poking out of the murk. At first Rubin thought someone had fallen in and was unconscious. “I kept waiting for him to wake up, to move.€ She watched for a while, but he didn’t move and he certainly didn’t wake up. Initially the victim, a Queens College student, was thought to be part of a series of crimes against gay men that had taken place that January in the Village and Brooklyn, but the police determined that this wasn’t so. There was no evidence of foul play and the circumstances of the man’s death were never discovered. Officially this blog is about the experience of women in photography from the Seventies on, but another character keeps crowding onto the stage. You can’t talk about New York photography in the 70′s and 80′s without acknowledging the multi-faceted, noirish force of crime, dirt and fear that cast a pall over the city, blotting out its legendary glamour, choking off its dreams. Physically, New York was falling apart. The roads and streets were crumbling, the bridges and piers were buckling, and the Bronx was going up each night in flames. 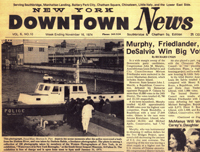 To many, including President Ford, the city was beyond hope and help. Today it’s a different picture. Landscaped parks stretch for miles along the river, and sleek glass condos poke into the West Village sky. Meat packing is gone and boutiques have moved in. Crime has fallen to record lows, and it is altogether a much safer and better place. Yet sometimes a strange nostalgia creeps in for the drama of that earlier day, and for some, if not all, of the visual grit and dark poetry that went with it. 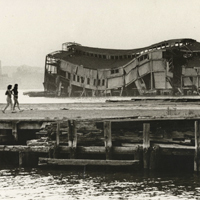 Note: Darleen’s photographs of January 17, 1973 were exhibited in Waterways of the New York Boroughs (South Street Seaport Museum 1974-75)*, Taking a Different Tack–Maggie Sherwood and the Floating Foundation of Photography (Samuel Dorsky Museum of Art at SUNY New Paltz, 2009, and at the Salmagundi Club show accompanying the Be-hold photo auction in 2010.